The Cobra H.I.S.S. tank storms into battle, raking the field with devastating firepower from its twin cannons. Driven by a Cobra H.I.S.S. commander, this armored vehicle barrels toward the G.I. Joe team, intent on cutting a path for the advancing Cobra forces! High Speed Sentry (H.I.S.S.) tanks are one of the Cobra organization’s primary combat vehicles; these armored workhorses can move at a good assault speed and can blast the G.I. Joe team with turret-mounted cannons. Cobra H.I.S.S. commanders are specially trained to use the sophisticated electronics to maximum advantage: infrared for nighttime attacks and radar for pinpoint targeting accuracy. Cobra H.I.S.S. tanks have been at the front defending Cobra Island and in the Battle of Springfield, the town controlled by Cobra. Cobra H.I.S.S. commanders are selected from the best of the Cobra infantry forces for specialized training in how to operate these top-of-the-line armored tanks and use the vehicles’ sophisticated electronics systems. They’re chosen for their skills, physical strength and initiative (which means they’re some of the nastiest, toughest and most aggressive troopers in the entire Cobra army). Cobra H.I.S.S. commanders are graduates of Cobra Battle School and Advanced Weapons Systems Training. Prepare to roll into battle with this incredible “armored” vehicle! Open the canopy, slide the Cobra H.I.S.S. Commander figure inside the turret and get ready to face off against the G.I. Joe team. Swivel and elevate the vehicle’s cannons and advance toward your opponent as the H.I.S.S. tank vehicle leads the way with its free-rolling wheels. With a platform that can hold the rest of your troops (figures sold separately), you’re ready for the battle to begin! 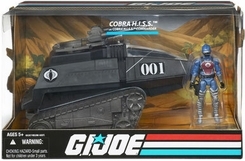 Vehicle comes with Cobra H.I.S.S. Commander figure.